Dynamic Laser Scanner - CMM Inc. 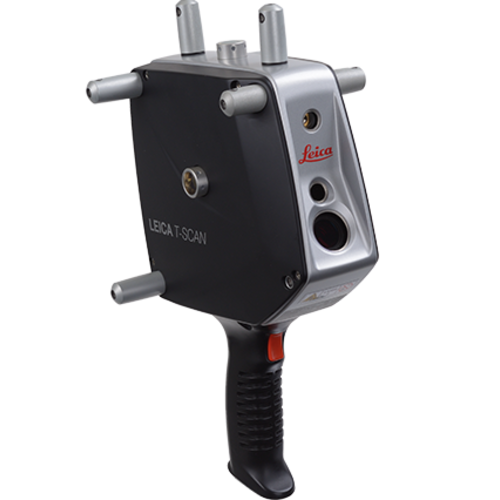 The Leica T-Scan is more than just an average line scanner; it’s a high-speed hand scanner for large-volume portable applications. The Leica T-Scan precedes performance from any previous generation models, with its improved point acquisition rate and superior performance on challenging material types. The Leica T-Scan can scan large objects more accurately and 50 percent faster than comparable products thanks to its unique technological design.The T-Scan's Flying Dot technology is a unique truly automated scanning solution. Also, the laser power automatically adjusts to achieve the best measurement result of a specific surface type. Furthermore, The Leica T-Scan’s laser intensity can change to shiny metallic or dark surfaces in one scan pass. The technology is resistant to shifting environmental light – allowing preparation time to be reduced to an absolute minimum. Powdering is also not required. Benefit from up to 25% improved total system specifications by combining the Leica T-Scan with the Leica Absolute Tracker.